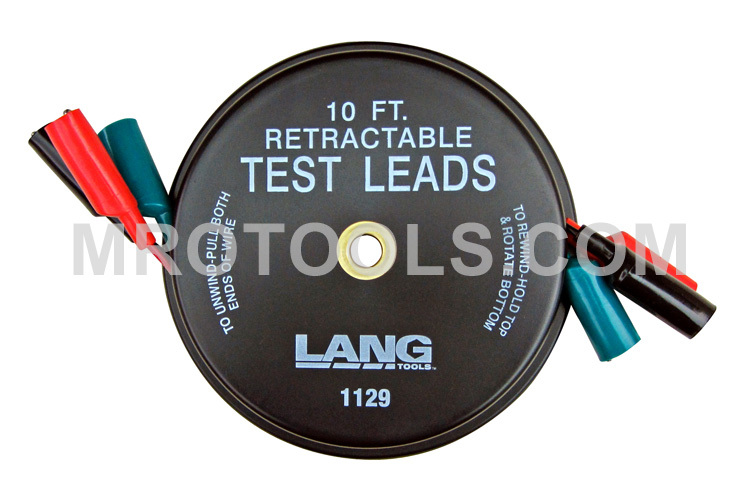 Lang Retractable Test Leads are used for testing electrical circuits in cars, trailers, boats, and more. Lang retractable test leads pull out and rewind when not in use, and feature 18 gauge copper wire with insulated alligator clips, different color wires for easy identification, and a maximum amperage of 10 AMPS fully unwound, 6 AMPS wound. The 1129 Lang Retractable Test Leads - 3 Leads X 10 feet is one of thousands of quality tooling products available from MRO Tools. Please browse Lang Digital Thermometers, Multimeters & Test Leads for tools similar to the 1129 Lang Retractable Test Leads - 3 Leads X 10 feet. 1129 Lang Retractable Test Leads - 3 Leads X 10 feet description summary: Lang Retractable Test Leads - 3 Leads X 10 Foot. Used for testing electrical circuits in cars, trailers, boats, and more. Retractable test leads pull out and rewind when not in use. Quantity discounts may be available for the 1129 Lang Retractable Test Leads - 3 Leads X 10 feet. Please contact MRO Tools for details.